"When will Sleepy Eyes Chuck Todd and @NBCNews start talking about the Obama SURVEILLANCE SCANDAL and stop with the Fake Trump/Russia story," the president tweeted. Nearly 20 minutes later, he added: "It is the same Fake News Media that said there is "no path to victory for Trump" that is now pushing the phony Russia story. A total scam!" Todd appeared on NBC's "Nightly News" on Friday, where he discussed the Russia investigation and how Trump's unsubstantiated claims of President Barack Obama wiretapping Trump Tower has created "all of the current problems for this West Wing." "This has all been self-inflicted. The Russia cloud is dark enough," Todd continued. "This sort of Nunes Keystone Cop situation has made it that much worse. And again, it all stems from the fact that the president himself will not accept the idea that there is going to be a Russian investigation." The FBI is investigating potential connections between Trump campaign aides and the Russian government, which intelligence agencies say tried to interfere in the 2016 elections. The Trump administration has claimed that alleged surveillance of its campaign — and potential unmasking of campaign officials in intelligence reports — by Obama administration officials is the bigger story, following the president's tweeted statement that Obama wiretapped him. Later Saturday, the president tweeted: "Wow,@FoxNewsjust reporting big news. Source: "Official behind unmasking is high up. Known Intel official is responsible. Some unmasked.... ..not associated with Russia. Trump team spied on before he was nominated." If this is true, does not get much bigger. Would be sad for U.S."
Todd responded to Trump's tweet, saying he "slept well" and doesn't feel "sleepy at all." Saturday afternoon, Trump praised the "failing" New York Times, despite repeatedly criticizing the publication's coverage of him, likely referring to a story published online Friday. Trump also implied that he would be willing to work with Democrats for a new health care plan, and not just Republicans. "The failing @nytimes finally gets it - "In places where no insurance company offers plans, there will be no way for ObamaCare customers to.." he wrote. "...use subsidies to buy health plans." In other words, Ocare is dead. Good things will happen, however, either with Republicans or Dems." 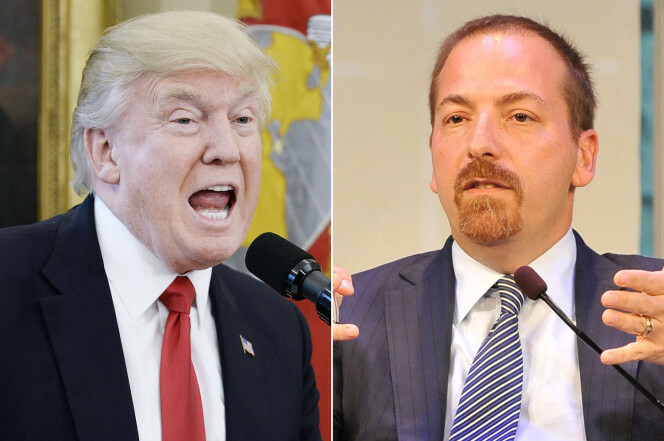 0 Response to "Trump takes aim at ‘Sleepy Eyes’ Chuck Todd"